5 One-Press Temperature Setting + Keep Warm + 360°Swivel + Cord Wrap. Build with strix control to accurately detects and controls the water temperature. Auto shut off; Boil dry protection, Precise temperature control, and 30mins keep warm. 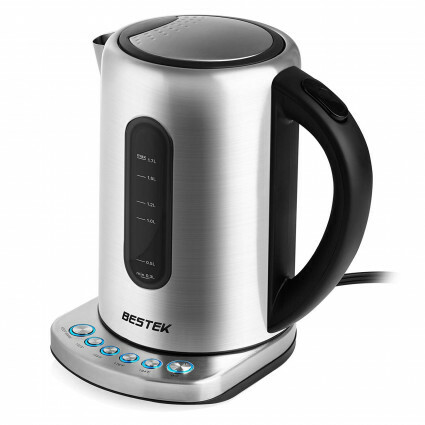 With 1500W power, this electric kettle heats up water rapidly while keeping noise to a minimum. FDA certification, 304 food-grade stainless steel body & BPA free water gauge, handle and filter.